As we prepared for the inaugural group of students to start in August 2018, one of our most important endeavors was building the team who will teach and lead the dyslexia program. After an intensive and thorough search, we are pleased to introduce the program’s director and faculty. Elaine recently moved from the Chicago area. She brings a strong background in reading intervention and support at all grade levels. Through her experiences in remediation focused settings Elaine has developed a passion for inspiring motivation and success. Elaine has worked in schools in California, Illinois, and Georgia. She studied at University of Wisconsin, California State University, and Northern Illinois University. In addition to enjoying her work with students Elaine is active in her church Bible studies and often leads small groups. We are thrilled that Elaine has come to the South and joined the Walker family. 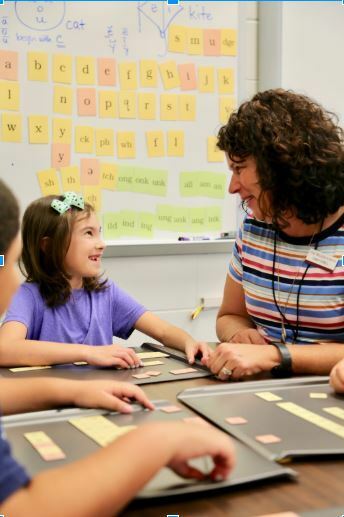 Virginia previously worked with students with language-based learning differences at the Swift School and The Lovett School. She enjoys working with students and their families to assist and support their academic progress. Virginia is intrigued by the development of the brain and the reading process, she has attended two reading and the brain conferences in addition to her Orton Gillingham training. Virginia earned her bachelor’s degree at the University of Georgia and her Master's degree from Loyola University. Sarah Null, our Lower School Learning Specialist, serves as an integral part of the entire Lower School Support Team. An Associate of the Academy of Orton-Gillingham Practitioners and Educators, she has supported Walker students since 2015. Sarah is a Certified Dyslexia Therapist for the International Dyslexia Association, and she is trained in Orton-Gillingham’s multisensory method for teaching math. In the Lower and Primary Schools, she provides faculty and curriculum support and works with students in need of individual support.